Islam teaches one to be dutiful to his Lord and kind to the creation. Objectives: Explain how the Muslim community shows respect for each other and carries out its religious duties and good actions. Respect: Every Muslim has rights given to them by Allah. Other Muslims have a duty to protect and respect those rights. The Prophet (peace and blessings be upon him) stated that the life, property and honour of one Muslim are sacred to another. He also stated that a true believer wishes for his brother what he wishes for himself. Respect the property of others. If something belongs to another person, do not steal it, or damage it. If you are lent it take good care of it and return it as soon as you have finished with it. Respect the feelings of others. Do not bully or tease; do not frighten them, or upset them without reason. If you have bad news to tell them, tell them gently. Respect their privacy. Do not enter their homes without an invitation; do not demand their news but allow them to offer it instead. Treat everyone you meet with good manners to show that you recognize that they are as important as you. Respect yourself. You are valued by God and have a duty to care for yourself. Keep yourself healthy and fit. 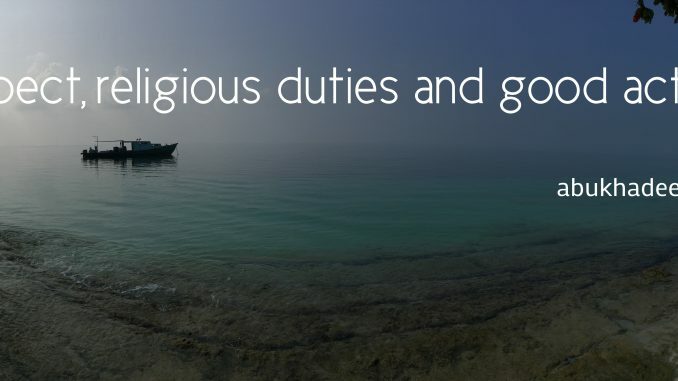 Religious duties: The religious duties of the Ummah are to carry out the Five Pillars, to celebrate the festivals, to obey the laws of God and to follow the example of the Prophet (peace be upon him) and his Companions. Some of these duties like prayer and fasting they can all do. Others, like Hajj, some will do and others cannot due to lack of finances. In order for the Muslim community (Ummah) to function well, it needs experts in the Qur’an, Sunnah and Sharī’ah Law to make sure that the true teachings are not forgotten. It needs judges to settle disputes between Muslims and to rule on matters like divorce, inheritance, etc. It may need governors, leaders and scholars who will speak on behalf of the community or village to the ruler or the government. All of this is achieved by remaining as a jamā’ah (united body) under the ruler of the country without rebellion, street demonstrations and violence, which are all forbidden under Islamic law as they lead to upheaval in the Ummah. Every Muslim should be generous with their time and their money to help those around them. This is the duty of sadaqah or charity. For the Prophet (peace and blessings be upon him) charity was more than giving money. Righteousness includes everything from praising and glorifying God, to helping people in any way possible. Even smiling in the face of fellow Muslim is considered sadaqah (charitable act). And this charity naturally extends to non-Muslims also, whether they be neighbours or colleagues at work and so on. Righteous actions are only rewarded by God if a person worships Allah alone and does not commit idolatry. Idolatry is to worship gods besides Allah, whether it be idols, saints, angels, prophets, stars or the dead in their graves. The optional righteous deeds are never more important than the obligations such as Prayer, Zakāh, Hajj and Fasting since these are from the Five Pillars – so a Muslim is expected to practice Islam and increase one’s faith (imān) further with optional righteous actions, and not replace the Five Pillars. A Muslim who does a lot of charitable work but does not pray the daily prayers, pay the Zakāh or fast Ramadan is not considered as righteous, at all. Allah stated in the Qur’an 49: 10-12 what can be summarised as: O you who believe, do not let one set of people make fun another; do not insult one another by calling each other names; do not spy on one another, or spread rumours about each other or criticize people behind their backs. Summary: You should now be able to explain how the Muslim community shows respect to each other and carries out its religious duties and good actions. 1. Read the case study and write a list of things that are respectful and things that are disrespectful in Islam. 2. Do you think people generally treat each other with respect? Give an example where respect was shown and another where it was not (in your own life experience). 3. Think about the place of prayer in the life of a Muslim. A Muslim says: “I can’t help on Friday lunchtime at college because I have to pray the Friday prayer.” What do you think a non-Muslim teacher would say about this? 4. Suggest some practical ways in which Muslims may be able to help others. Exam tip: Good examples can help you to explain how Muslims are expected to help others.